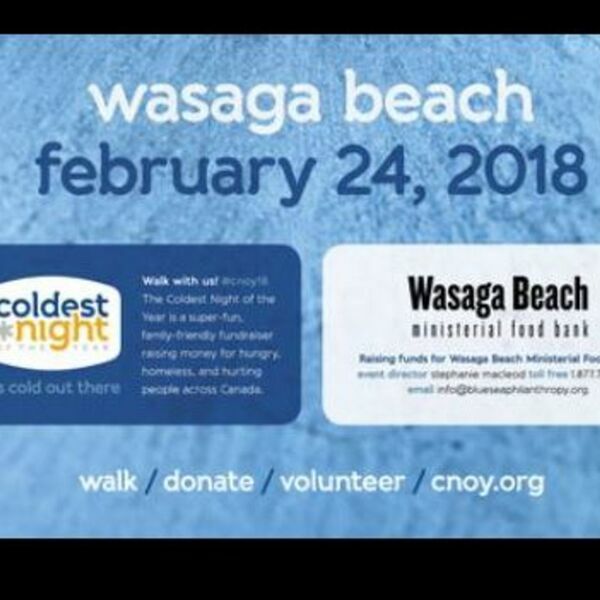 Description: Get ready to bundle up with the Coldest Night of the Year on Saturday, February 24th at 5:00 p.m. in Wasaga Beach. Over 110 communities are participating in this Canada-wide walk fundraiser including for the first time, the town of Wasaga Beach for the homeless and struggling people in each community. The fundraising goal is to raise $25,000 for the Wasaga Beach Ministerial Food Bank. Joining Dianna for this week's show, via phone is event director, Stephanie MacLeod who will share all the details of this first event in The Beach. Please share this great local program. Get ready to bundle up with the Coldest Night of the Year on Saturday, February 24th at 5:00 p.m. in Wasaga Beach. Over 110 communities are participating in this Canada-wide walk fundraiser including for the first time, the town of Wasaga Beach for the homeless and struggling people in each community. The fundraising goal is to raise $25,000 for the Wasaga Beach Ministerial Food Bank. Joining Dianna for this week's show, via phone is event director, Stephanie MacLeod who will share all the details of this first event in The Beach. Please share this great local program.